You have a list of keywords in your Excel worksheet freshly downloaded from keywords tool like Adwords Keyword Planner, Keyword Spy.com, SpyFu.com, etc. You need to split this list of keywords into smaller groups that contain similar words. This is the tool that let you segregate your list quickly. 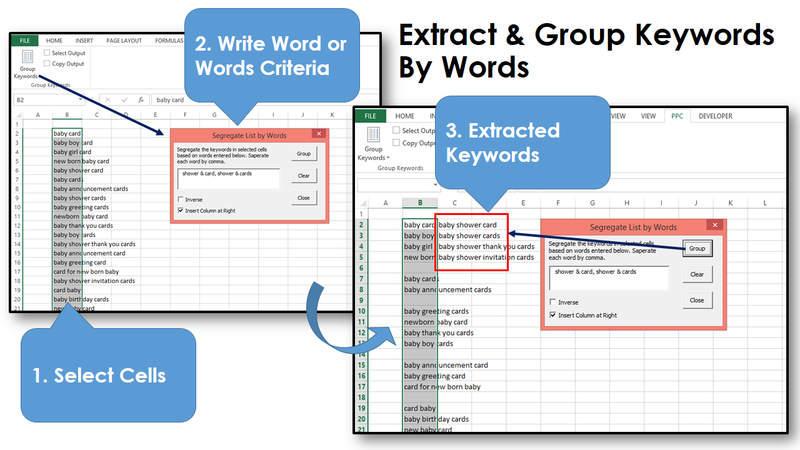 Wordz Group is an Excel add-in that extends functionality of your Excel to segregate and group keywords into multiple lists quickly. It segregates keywords based on specific word or words contained in the keywords. You can download it here at no cost. We want to segregate the list into multiple lists like card for baby boy, card for baby girl, card to congratulate new born, card to make baby announcement, etc. Extracting keywords based on words. Keywords that contain the word(s) will be grouped into a new list and placed at the right column of the selected cells. These keywords will be deleted from the original list. by using "shower, showers" in the text box, Wordz Group will extract keywords that contain either shower OR showers. So you will have keywords like "baby shower card", "baby showers card", etc. by using "baby & boy" in the text box, Wordz Group will extract keywords that contain both "baby" and "boy" words. So you will have keywords like "baby boy card", "baby boy announcement card", etc. And we have more... find out our full solution for keywords and the secrets to speed up keywords tasks.